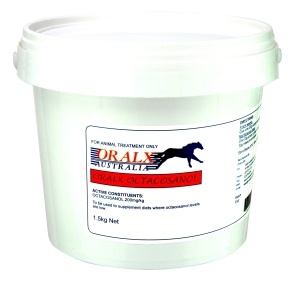 Octacosanol is a concentrated nutrient derived from wheat germ. Nutrition scientists were on the trail of octacosonal way back in the 1930's, when they discovered that oils extracted from wheat germ had the ability to improve endurance and stamina. Later experiments revealed that the oil also reduced oxygen stress and quickened reaction time. Further analysis found that, in addition to vitamin E and essential fatty acids, wheat germ oil also contained several long-chain alcohol molecules. The performance-boosting effects of wheat germ oil were stimulated by these substances, one of which was octacosonal. First 4 weeks: Give one 30g scoop morning and night in their feed. Maintenance dose: One 30g scoop a day in their night feed. Available in a 1.5kg tub. Larger sizes available on request.